Rodney plays The Cultch in 1 week! 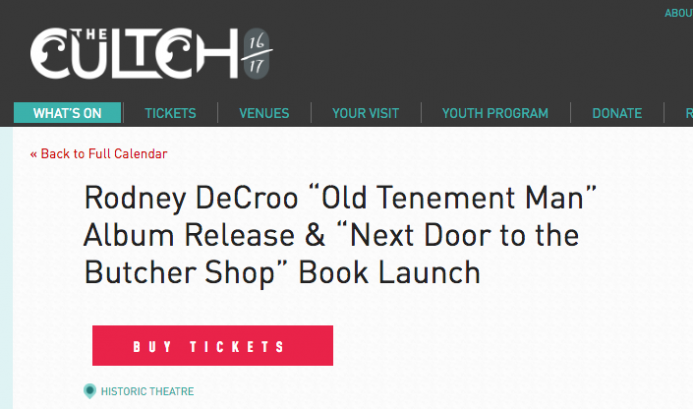 Rodney DeCroo celebrates the release of his 7th studio record ‘Old Tenement Man’ and the his poetry book ‘Next Door to the Butcher Shop’ next Wednesday, May 31 at The Cultch with support from Geoff Berner and Fraser Mackenzie. Buy your advance tickets today and save $5 off of the door price! Early show! Doors at 7 / Show at 8pm sharp! Find tickets via The Cultch online here or pay-by-phone at 604-251-1363.